The World of Edena, the first volume in Dark Horse's Moebius Library, is part adventure and part spiritual. Back in the early 1980s, Moebius discovered the tiniest gem of a much larger story in a comic that was basically a promotional comic for French car salesmen. Moebius is maybe one of the only cartoonists who could take a paying gig for a company like Citreon and turn it into the opening chapter of a cycle of stories about how the late 20th century humanity has disconnected itself from everything pure and good that came before. Starting with the short story “Repairs,” Moebius discovers Stel and Atan, two very plain and non-sexual repairmen who have to fix the fantastic machines of the future. “Repairs” is very much a Moebius story of its time-- a freewheeling exploration of imagery and themes that displayed Moebius’ 1970-ish creative freedom. 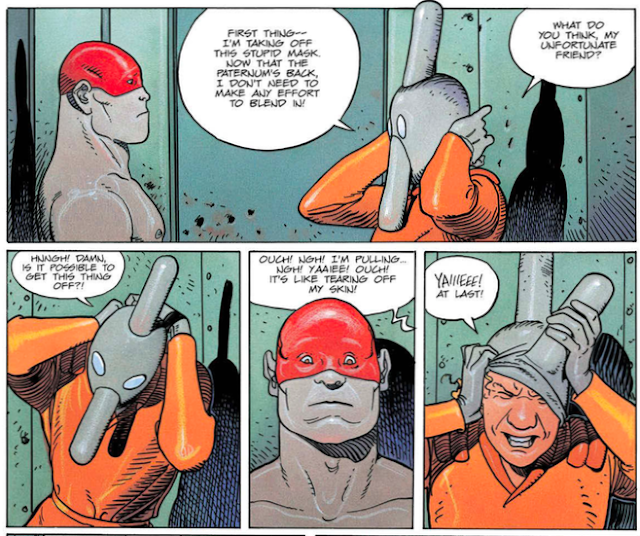 But from that story, Moebius would spend nearly the next 20 years struggling against his own desired freedom and the world’s pressure to categorize, normalize, quantify and regulate his creative impulses and desires. The stories of Edena come after some of Moebius’ career-defining work. In the 70s, he created Azrach and Le Garage Hermétique, drawing visions unseen in comics in any language before. From Jean Giraud’s (Moebius’ real name) western Blueberry to Moebius’s La Banard Fou, two very different creators existed within the same man, hence the name “Moebius.” But moving into the 1980s, Moebius would begin working on two very different story cycles; his Edena stories and The Incal with Alejandro Jodorowsky (previously written about here.) 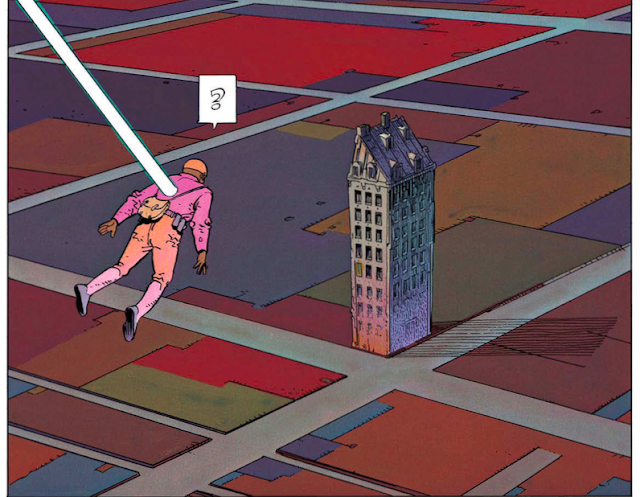 The Incal spun out of Jodorowsky’s failed attempt to adapt Frank Herbert’s Dune into a movie (see the excellent 2014 documentary Jodorowsky’s Dune to find out what happened there) and just maybe the Edena cycle then spun out of The Incal. In his loose attempts to create a Moebiusverse (Major Grubert from Le Garage Hermétique may or may not be a flawed god on Edena,) the story “Once Upon a Star” shows Stel and Atan travelling from this world to the next and the next is a veritable garden of Eden(a) with them as the Adam and Eve of this perfect world. While their time on Edena begins with it as a heavenly paradise that is theirs alone to explore, they both become changed by it and discover the corruption that infests this world. Transitioning from a man-made science fiction world to a world that’s purely nature, Stel and Atan find themselves shipwrecked on Edena and separated from every artificial and processed thing that they believed made them who they are. Moebius is very clear in his belief that they’ve really escaped the manufactured reality that stunted who they were. In the early stories, Stel and Atan were very non-sexual creatures, not possessing any clear characteristics or desires associated with gender. But Edena frees them from their manufactured reality and frees them to be a man and a woman. And like in Eden, Stel and Atana (as her name morphs into as she clearly develops as a woman) will partake from a tree of knowledge and will experience their own expulsion from paradise. Once Edena becomes something other than a paradise, Stel starts to experience base sexual desires that frighten Atana and she goes off on her own. Separated, both discover the people of Edena, sealed up and hidden from the germs of the world. While Edena may have it own giant metropolises, its people are even more isolated and non-descript than Stel and Atana were at the beginning of their stories. The beautiful and powerful Atana is viewed as a goddess to rescue them from this sin at their core while Stel discovers the true actor behind the fall of this paradise. On their own, both confront the serpent of this garden yet neither has the power to overcome him. Moebius wields art like a weapon. Drawn over the course of 20 years, The World of Edena is a lush book. Sometimes Moebius’ artwork is detailed and beautiful. Stel and Atan’s early days on Edena contain some of the best cartoons of forests and nature. But other times, his work becomes loose and cartoony, reflecting more of an emotional state than a physical state. His artwork in The Incal often functions the same way as Moebius’ shifting narrative concerns are mirrored wonderfully in his artistic choices. We often look for and demand the artist to create a visual tapestry that doesn’t break the illusions of the reality that they’re creating but for Moebius, style is a tool and a choice. 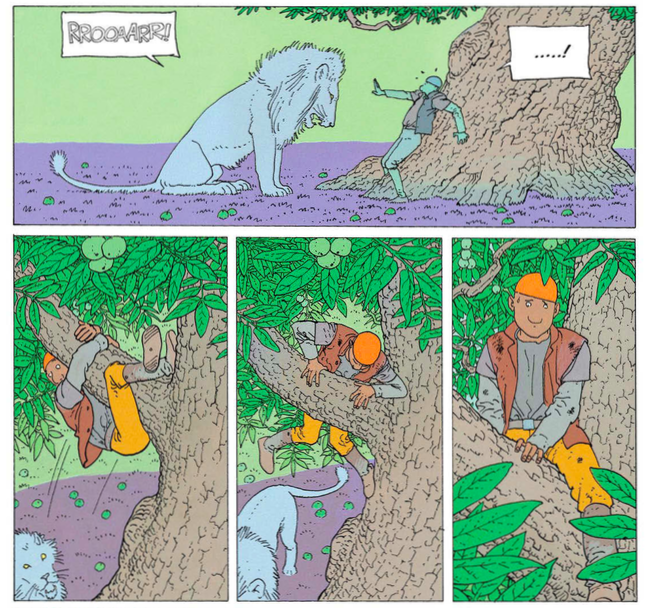 Through these shifting visual moments, Moebius creates an alternate reality that’s not grounded in a concrete reality but in very emotionally and spiritually driven perceptions. The world of Edena symbolizes a constant struggle between our nature and our nurture. 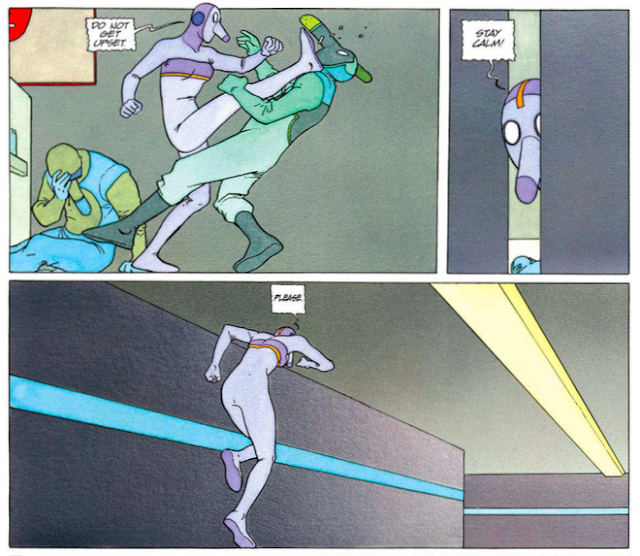 The shifting art styles enhance the uneasiness of Moebius’ story. Stel and Atana are never on any kind of steady ground and Moebius never lets his reader have any surety that his characters don’t. As we’ve seen this story released in drips and drabs over the past 20 years, it’s been difficult to judge the effect of the art but in this one collected volume, this may be the most definitive representation of Moebius art because it shows everything it was capable of as well as how Moebius was able to use it as a storytelling tool and not as just the story itself. 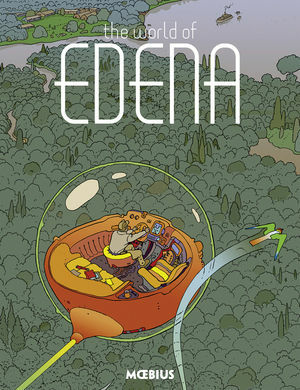 The World of Edena is the first time "SRA," the conclusion to Moebius’ Edena cycle, has been printed in English. From its beginnings, you could see Moebius improvising the story as he went along. And he improvised it up to the end. The final chapter of The World of Edena doesn’t offer any type of conclusion, only more of a restating of the conflicts that go on and on even after the book ends. It’s frustrating to follow the journey of Stel and Atana and to realize that Moebius never really had any vision for where their journey was going. Maybe there’s something zen about that-- a battle for everything with no clear conclusion or victors-- but it makes the book an ultimately frustrating reading experience. Moebius, in trying to be profound or artistic or even uncommitted to an ending, leaves the story wanting a conclusion because he does not or cannot resolve the story of Stel and Atana. Moebius was an artist and creator of imagination. In his solo creations and his collaborations with Alejandro Jodorowsky, Moebius created worlds like we had never seen before and will never see again. The World of Edena is Moebius’s work where he pours the most of his beliefs and his philosophies into, making a prolonged argument against mankind’s consumption of all kinds of things processes and manufactured. And within his large themes and his deep imagination, Moebius tells a very human story of two characters who are separated by a world. Stel and Atana are these two characters who are searching for the other one but they are stuck on a world that will do everything it can to keep these two lovers apart.